Do you want a green friendly rotary trimmer? Well, you came to the right place! The Carl Green Machine rotary trimmer is not only made out of recycled materials, it is made of light harvesting acrylic material, resulting in more accurate cuts. With a swin Product number CUI72006. 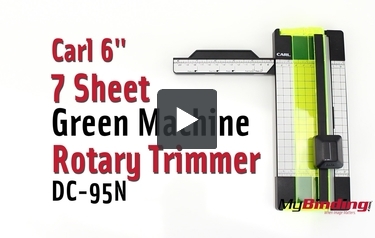 Transcript: This is the Carl 6” Personal 7 Sheet Green Machine Rotary Trimmer! It’s a small compact design, with a measuring arm that swings out for easier storage. To use, lift of the blade and clamp, then insert your project—it can cut up to 7 sheets at a time as seen here. There is also a cover on the blade, make sure that it is turned properly to reveal the blade. Then push down and bring the blade across the entire project for a clean cut. This is the Carl 6” Personal 7 Sheet Green Machine Rotary Trimmer! On the right it measures out to an inch. On the left it measures a little over 8 inches. Some common measurements are also labeled. And the grid is in centimeters. There are some measurements on the other end as well. By pulling up on the end of the clamp, you can remove the blade. This way you can replace it, or swap it out for a perforating blade that is sold separate. You can see closer up how the cover works for safety, then just slip the blade back in. From time to time you’ll want to also change out the cutting mat—but before you change it, you can spin it and rotate it around for a total of four clean positions. It pulls out and is reinserted fairly simply as it just snaps back in. For help finding replacement parts give us a call and we can help you find the appropriate pieces! Does this machine work with all the special blades? Thank you for your question. Unfortunately the Carl 6" Personal 7 Sheet Green Machine Rotary Trimmer does not work with all of the special blades.